Amanda Binkley - Agent, Tennessee — Main Street Travel Co.
Amanda is an educator in Clarksville, TN. She is the mother of two rambunctious boys who love Star Wars, Buzz Lightyear, and Mickey Mouse. She is known for "speaking Disney" with the kids and can often be found conversing with her students about the latest Disney film. You might also catch her sporting a Beauty and the Beast t-shirt under her blazer or a pair of Mickey Mouse tennis shoes. She has a passion for all things Disney and has since childhood. Her early memories of Disney are trips with her grandparents to the "happiest place on Earth." That love of Disney has only increased as she has grown up and raised her own family. 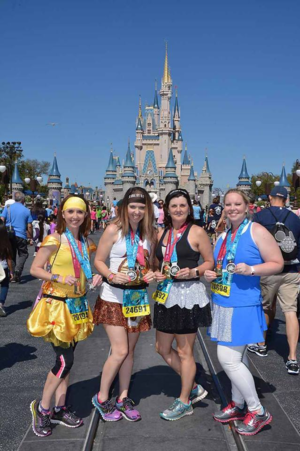 An avid runner, Amanda has completed multiple runDisney events. She is a marathoner and triathlete with the experience to assist the die hard athlete or the novice runner with planning the perfect race trip. She also plans a yearly trip to Walt Disney World Resort for her family.She considers Disney her "home away from home" and would love to help you make your own magical memories. As an educator, she also has the experience to plan group trips for students. She has participated in and planned group trips for Epcot's Candlelight Processional. She can also help you with your school and sports team trips. From family friendly trips, to group events, to a "weekend for the girls", Amanda has the tools to build the Disney trip for you! AMANDA IS ABSOLUTELY THE BEST!! AMANDA WENT ABOVE AND BEYOND OF WHAT IS EXPECTED OF A VACATION TRAVEL PLANNER. SHE WAS SO HELPFUL IN SO MANY WAYS.. IT WAS A TRIP THAT WE WILL REMEMBER FOR A LIFETIME.